Recently I have read several very well written articles on the "fall" of Dog Shows as a sport. The reasons targeted in these articles were all correct, they are all problems that do reside in our sport and it certainly would be nice to see them eliminated. However, are they the true reason our sport is dying? No. Now you are probably wondering by now what my credentials are to be so brilliantly informed that I could diagnose the problem that is killing our favorite past-time, our sport, for some of us- our livelihood. Well as much as I hate to disappoint I am somewhat of a "newbie" to the sport. I am only 20 years old and have been showing for less than two years. I did not participate in Juniors, I hold no degree related to dogs at all, and no one in my family but myself has ever even seen a dog show. I am so new that you could almost call me an outsider…and this makes me the perfect person to tell you why it is so difficult to love this sport as much as I do. Our sport is dying, stop attaching all of these excuses about the frequencies of shows and entry fees are too high for this and too much for that…though you are not incorrect…that is not the reason our sport is dying. Hear me carefully for this is not a metaphor…our sport, meaning its athletes, supporters, and donors are literally dying. I am talking about physical and spiritual death. The great breeders, the famous handlers, those who grew up with their family showing dogs…they are dying! Dog Showing once thrived in generations that were not this one… now that we are in this generation all of the old generations are slowly, literally dying. Our sport is not dying because it is simply a rich man's sport…that is a lie, this is a sport than can be played in a financially smart way. No, our sport is dying because it's people are dying. OK- so how do we save it? Obviously, there is no way for us to stop time from running its course…that is just beyond our control. So in anything, how is one generation replaced once they are gone? With a NEW GENERATION. "Oh but we offer Junior Handling at shows to reel the kids in!"…NO. Everyone reading this knows as well as I do that kids can't just walk in with their dog and say "Hey, I think I want to try this! Sign me up mom! "… not even close. Juniors is a wonderful thing but if you really pay attention it is mostly children of parents who breed, show, or are even professional handlers themselves. Though they are young, that is not the new blood we need to target. We want to expand, we want to grow! Now, if no one has ever told you, let me be the first. The veterans of this sport make it INCREDIBLY difficult for us newcomers to love this sport. Myself, I am only still around because I tend to ignore the way people treat me… not everyone is like that, especially not in my generation. If you do not know my generation well, we are extremely over-sensitive and we are offended by EVERYTHING. That is why it takes about 10 minutes for a newcomer of my generation to get ticked off at a dog show. I have tried to bring family members and friends that have never even experienced anything like a dog show along with me and they leave HATING it. Let me tell you why, I don't have all the answers but I guarantee you that with just a little thought, the more experienced folks may be able to figure the solutions out. When I started showing I was merely helping out a friend of mine in Chinese Cresteds who was generously donating his time to teach me the basics. We were at a show one day, it wasn't my very first show but it was of the first five, I was handling a small and timid Chihuahua client dog of his while he was in another ring. I waited very patiently right by the steward's table with the number "9" wrapped around my left arm. I could not move away from her table because I was so nervous that I would miss my ring-time if I left. So I waited, finally my class came up but I did not really have a full enough understanding of the class system to know that was my class. As it turns out, the steward had called my number and she was an older lady with a gentle tone, I had mistaken her calling out the number "5" but she was actually calling my number, "9". She called for a second time and I then realized my mistake and rushed in the ring, my nerves had tripled. As I fell in line to stack my little Chihuahua, a VERY well known handler in front of me turned around and remarked "How many times were you going to make her shout your number before you finally came in? Some of us have other dogs to show. "… I was appalled that someone would make such a remark to someone so obviously new, just because the steward had to call my number twice. The judge finally directed us to go around the ring. I stood up and looked down but the already timid dog that I was handling had all but curled into a ball and was immobile. He could tell that my nerves was completely shot. I tried my best to pep him up and and eventually we made it around the ring. After the class was finished, as I was walking out the Judge grabbed my elbow and stopped me… "Don't you let these old women walk all over you" She said with a very tender smile. That judge is the only reason I ever set foot in the ring again. So this paragraph is for the handlers…what could you do differently to help a newcomer OR what could you be doing that might be turning away newcomers unintentionally? To the breeders… Fortunately for my mentor in my own breed, this has not yet happened to me however I have seen it many times. "We all had our first dog" So many veterans have said to me or to friends of mine that are starting out. A friend of mine called a supposedly reputable breeder to obtain a show quality French Bulldog from her. They talked for months and went through the reference process, the interview process and finally this breeder agreed to sell my friend a puppy. I took my friend to shows and we met a few "Frenchie" folks and observed their handling and their grooming. One very kind handler even showed us a few of his grooming tricks. She finally got her puppy and started showing him. She showed him well! She gaited him beautifully and had taught him to hold a stack very well- but she never won. Months later while at a show we ran into the same handler that had showed us the grooming tricks and we asked him "Why is this puppy not winning anything?" That handler whipped out his phone and pulled up the Frenchie standard and explained in exquisite detail as to why the puppy was essentially a conformation train wreck. My poor friend had no idea, nor did she have a mentor to help her so the breeder sold her a puppy for a show quality price that was deeply pet quality. I can understand if you chose not to sell the absolute best puppy in the litter to a newcomer, but giving them the worst of the litter just because they are new…Does that seem right? That friend has never set foot on a show site again and lives quietly with her PET frenchie, Rosco. Now to the know-it-all, whether you are a vendor, breeder, handler, or even spectator. I will never forget first time I asked my mother to tag along to the dog show with me. My mother was holding one of my dogs ringside while I was competing in the ring at an outdoor show. The dog my mother was holding had a bowel movement while she was watching me, she had no idea that the dog had used the bathroom behind her. Suddenly, a ferocious vendor comes trampling between the rings and throws a "poop-bag" at my mother and shouts "It is people like you that ruin it for all of us!". IF I am somehow able to convince my mother to come back to a show, she sits ringside and she does not move. She will not hold a dog for me and she will not walk around. She goes straight from the car to the ring and back again while hating every minute of it. So tell me, if you were a newcomer or a paying spectator who just spent $20 just to park your car…would you come back? To the owner-handlers (this is my category)… I am going to be bold with you because I have so much respect for you and love you dearly. STOP TELLING EVERYONE THAT IF THEY ARE NOT PAYING $1,000 PER SHOW TO HAVE THEIR DOG HANDLED PROFESSIONALLY THEN THEIR DOG WILL NEVER FINISH. If someone asks me "when are you putting her with a handler" again, I might just scream this at them. I have a shocking news update for the show world… some owners have finished their own dogs before. Yes it is true, there are some judges who do play favorites in the ring and put up their friends…don't enter under those judges again and your problems are solved! An owner CAN finish their dog and an owner CAN be a great handler of their own dogs! Professional Handlers do win a large amount of the time, but has anyone stopped to think that it is because they are professionals and this is their lively-hood? The very definition of professional implies that they have the talent or skills to display a dog more professionally than a non-professional. Do not spread lies to newcomers about not ever being able to beat a handler. 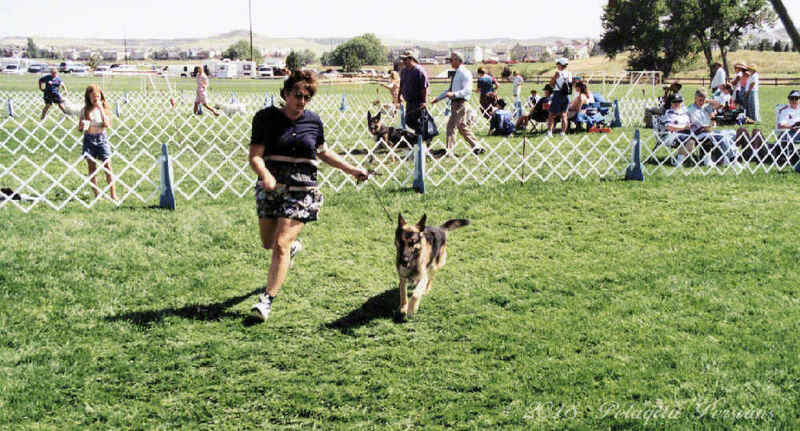 Owner-handler friends had me PETRIFIED to step into the ring when there was a major handler of my breed competing. Then a judge put me up with a 10month old puppy over two extremely nice adult dogs handled by two MAJOR handlers of my breed and I realized that is nonsense at just under 5 months of handling experience. I could sit here and go on for days with examples of situations like these that I have encountered in less than two years of people who made me want to quit. I could never quit because I love my dogs and I love the experience of being in the ring with them. I enjoy it, I have so much fun and they LOVE it too! My point is that we have to allow newcomers the chance to get that feeling, the chance to fall in love with the sport like we all did. You never know who is there for their first show, or second or third. There is too much drama in the world today, I am telling you veterans that my generation has no time or tolerance to welcome in a new activity that is surrounded by drama. If we love our sport and if we want it to be passed on through future generations and not just die off, then we must change our atmosphere. We must extend kindness and grace to those around us, we have to have fun ourselves. Make friends with the newcomers and please, PLEASE if they ask for help or guidance…help them without cruel or smart remarks. Never forget, you had your first show too. What made you come back? What did you enjoy? What did you appreciate that people did? What did you not enjoy? Did you ever not want to show again-why? What have people done in the past that have angered you or upset you? Ask yourself these questions and ponder… what can YOU do that might encourage newcomers and keep this sport alive? As a breeder, vendor, owner-handler, professional handler, or even as a spectator… How can you change our sport? Drew graciously allowed me to reprint his article. While Drew is speaking about his experiences and his opinions about why the sport is dying is about Dogs, this article still makes a lot of good points that can be applied to Cats. As many of your know, in the late 1980's I showed, trained and bred German Shepherd Dogs. After my car accident and the physical difficulties I had working with the larger dogs, hauling all the large equipment needed for dog shows, I made the difficult decision to stop showing and breeding dogs. I then had the bright idea to show Persian cats. So, I feel I am uniquely qualified to offer my opinion on being a "newbie" more than once. While most show people are nice, welcoming and helpful; many are not. I had difficulty buying nice, show-quality animals when I was first starting out. I was sold a Persian cat from a breeder that advertised "PKD tested negative" for all breeding animals; only to test my cat several months later and find out the cat was positive for the PKD1 gene. I was devastated. My experience is it takes about five years for the established breeders to take a newbie seriously which is a shame. I totally agree with Drew, we must nurture and guide newbies as this is where the future of our breed is once us old-timers are gone.